Tennis has always confused me. Not so much in terms of the gameplay, rules or that stupid ‘deuce’ scoring system, but more to do with how the fourth most followed sport in the world can have such a poor showing on the video game scene. I mean, it makes utter sense for football to lead the way, and the love for the American sports – football, hockey and basketball – are all pretty much a gimme. But tennis has long been the forgotten event in this industry and that has often left me to ponder. See, ever since the demise of Top Spin, the chatter from gamers the world over is that there is dire need for a new tennis title to hit the market. But nothing has ever properly materialised. At least not until now. 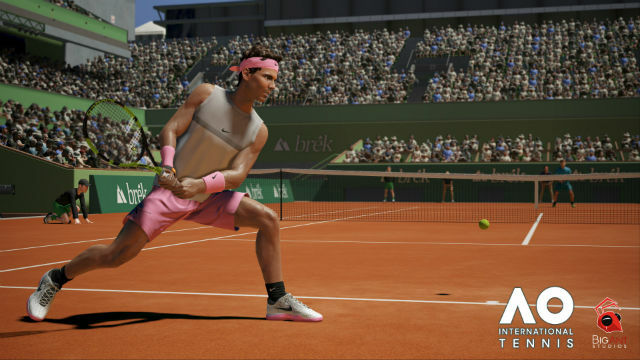 AO International Tennis is leading the charge of the racket brigade by rocking up on to the latest consoles with a whole ton of features, gameplay options, licensed players and the Australian Open in tow. But has the lack of competition allowed the development team at Big Ant Studios to still push the technological boundaries in order to deliver us a decent tennis experience? Well, if you’re looking for something that has been able to capture the essence of the wonderful racket sport then you are indeed in for a good time. But I’ve still been left wanting a bit more. That’s not because the gameplay options are lacking though. Not only can you take a big name player to glory in the full Australian Open, taking down the very first Grand Slam of the year, but a fully fledged Career mode allows the chance to take a fresh, green, user-created amateur from the bottom of the rankings, right up to the very top spot. That will surely please those with long term goals, and a Doubles competition brings further joy. Plenty of well designed, highly in-depth tutorials are present to ensure you understand exactly what is required for success, an Academy lets you find logos, stadia and even more players from the online community, whilst a solid online option lets you take your skills around the globe and play against both friends and strangers for ultimate bragging rights. Now, as is the case with most sports titles, the joy that you will find in this game pretty much boils down to how good the actual gameplay mechanics stand up. And as a spectacle that promises to deliver a serious simulation of the sport, AO International Tennis more than does the job. Control of your player is as precise and swift as it needs to be, and should you fail to prepare yourself for any return shot, will see the ball whizzing past to allow your opponent to gain the upper hand. But should you manage to prowl the court like a pro, finding yourself in prime hitting spot, the rest all boils down to your choice of shot type. And AO International Tennis doesn’t just let you swing a racket willy-nilly, with there being no less than a six strong field of shots to nail down. Flats, top spinners, lobbed balls, slices, drops and the good old smash are all viable point scoring opportunities and each is as crucial as the next in ensuring that you come out of any match on top. Especially when you go onto the front foot and start getting more aggressive with your play. It is here where AO International Tennis comes into its own too, as a clever shot power/precision meter combines well to see you needing to play safe at the start of any rally, before building up and allowing you the chance to manoeuvre into position and prepare for the big point scoring smashes and passing shots. It works supremely well and with every return, you’ll find yourself being smacked with a wave of adrenaline as the big match winners close in… no matter which of the court types you find yourself playing on. With your stamina levels also playing a key role at all times, it is up to you to press and release your shot type in the ‘green’ power bar area. Doing so will see your shot land pretty much where you request it to, but fail to action things properly, landing in the ‘amber’ or ‘red’ zones, and your ball will be overcooked and fail to find the precision needed. A mixture of fore and back hand shots will need to be utilised, along with slice and spin types in order for you to drain your opponent’s resolve before going in for the kill. Should you prefer to do away with using the face buttons, and really want to push your tennis skills to the limit, then utilising a swing with the right thumbstick is also an option. This works just as well, but in order to really feel like you are part of the game, and for your shots to come across as deliberate, the face buttons are the way to go. It is this timing which is absolutely crucial to how AO International Tennis plays out and the control scheme – the heart of the entire game – has been implemented brilliantly. Points really feel like they’ve been earnt, especially when you nail a big serve and smash an Ace right down the centre of the court. There have been the odd occasions when I’ve felt that the game hasn’t quite been able to keep up with the pace of the action, failing to recognise the shot I have been trying to play, but on the whole these have been few and far between. You’ll also need to consider playing from the baseline to build up big rallies, before deciding exactly when to rush the net in order to pull off that killer drop shot. In fact, if you have made it happen in real world tennis, then you can pretty much make it happen here. It’s also lovely to see that Big Ant have spent a decent amount of time in trying to make AO International Tennis look as good as it possibly can, and the courts, arenas and professional players themselves look great. The crowd, ball boys and line judges do feel a bit ‘android’ like, but I’m not going to moan too much when they play a fairly insignificant role. The audio is also spot on – aside from a baying crowd during breaks which is a bit over-the-top – and shoe squeaks, line calls, ball smashes and the agony of serving is both felt and heard. But there is a big old issue that arises and even though Big Ant have managed to shoe in no less than 20 professional players, the only really big name star is that of the cover athlete, Rafael Nadal. Yep, we also see the likes of David Goffin and John Isner rocking up in the men’s game, whilst the ladies are well catered for with Karolina Pliskova, Angelique Kerber and Naomi Osaka in place, but it’s sad to see other really big tennis stars omitted. This issue is never more prominent than when you take the game online and find yourself up against a bevy of Rafas. 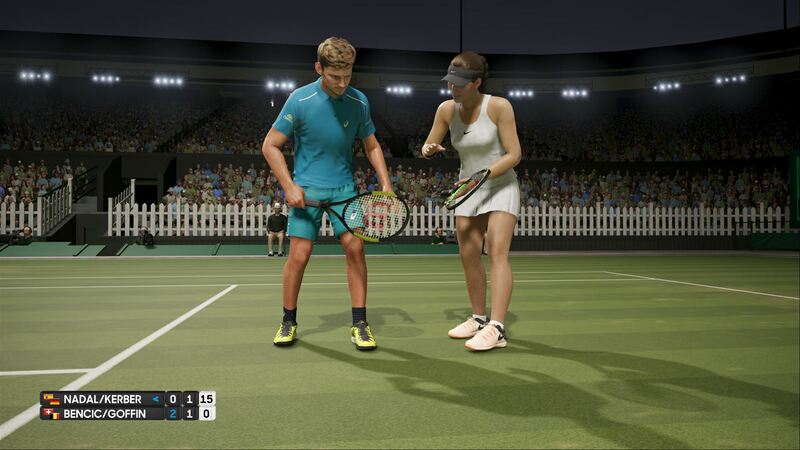 Much like EA have done with their sports series, a tennis game really does need a larger number of proper stars included for it to appeal to the masses, and AO International Tennis falls short here. That multiplayer option isn’t without fault either, and whether it is just solely down to a lack of players, or issues with matchmaking, sitting for a good 5 minutes or so waiting for a match is a fairly common occurrence. Yes, when it works all is great, with the online portion of AO International Tennis showing no sign of lag of gameplay problems at all. There are also just enough amendments of game settings in place too – just like the solo casual games – to allow you to tweak things as you see fit. But you should be aware that getting a match isn’t always a straightforward process. If you’ve got a mate or two with the game though, then well, you are pretty much laughing. But if truth be told, those – and the rather lengthy loading screens – are pretty much the only let downs with this tennis title. The rest of it, especially in regards the actual on-court gameplay – which, let’s be honest is what we are all here for – does exactly as we could ask. In turn that sees AO International Tennis come across as being right up there with the very best tennis titles available today. 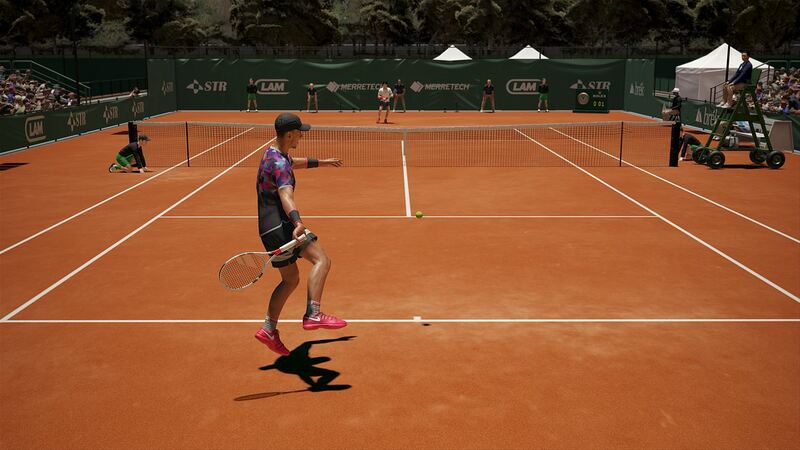 Granted, that group is a seriously small one, and it’s strange to have seen the tennis video game scene left to die in recent years, but Big Ant have proven that there is still plenty of love for the sport. You may find the lack of licensing an issue, but if you love Rafa Nadal, and enjoy a couple of games of tennis, then all is good in the world of AO International Tennis.